Make sure you’ve got the right tools to work on your car’s radiator and cooling system with our range of cooling system tools from Euro Car Parts. Browse the full range available below. Checking your car’s component parts remain at the right temperature is a crucial part in making sure it all runs as it should. Your car’s radiator and cooling system can become susceptible to wear and tear should any materials come into contact with them, which may result you frequently having to perform repair jobs from time to time. 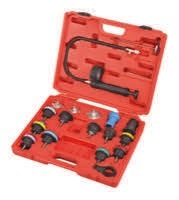 Within our cooling system tools range, you’ll find tester kits that can help you make sure everything’s working as it should, and there are no leaks in the system. 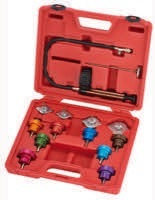 The tester kits are also useful for checking the pressure in your radiator. With Euro Car Parts, you can stock up on everything you need to make sure your garage is fully stocked and prepared for whatever maintenance task comes your way. We offer free UK delivery, and a free click and collect service too – take a look at our full range of car parts, tools and accessories today!